Melanie is a successful business woman. She owns her condo, has a two lovable pets and great friends. There is one thing missing though. Love and family. Melanie is an only child and although she still has her parents, she doesn't have a family, other than Odie and Clovis. Friends Grace and Max along with baby Ella and Grace's brother Bryce will be visiting Stephanie and the girls. This is the perfect opportunity to do a little matchmaking and ask Melanie over for an impromptu Christmas party. Melanie has nothing better to do, so off she goes and meets us with the gang. She's met Bryce in the past and always thought he was handsome, now it's time to find out if he could turn into something more. Meanwhile, she is finally pursuing something that she wants but has been a little afraid to go after...adoption. Since she doesn't have a husband, she's not sure whether or not she can, but there is no harm in checking into it. Nothing like a quick read during all the craziness of the Christmas holidays. 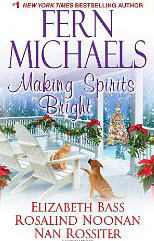 Making Spirits Bright by Fern Michaels fits the bill to a "T"!